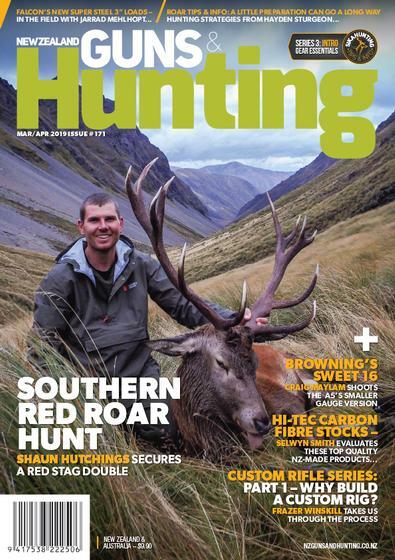 NZ Guns & Hunting is New Zealand’s national firearms magazine. Now in its 29th year of publication, NZG&H has established a solid reputation for reliable technical data and informed comment on guns of all types and categories - both modern and vintage, including hunting rifles and shotguns, blackpowder and military weapons, airguns, target rifles and pistols. Test reports on new firearms, ammunition, optics, shooting accessories and associated outdoor equipment appear in every issue, along with hunting articles, including game bird hunting & small game. NZG&H comments regularly on the politics of firearm ownership and gun control matters. best gun mag by far in NZ. Dedicated to firearms not fishing, informative and toucheson all area within shooting sports.